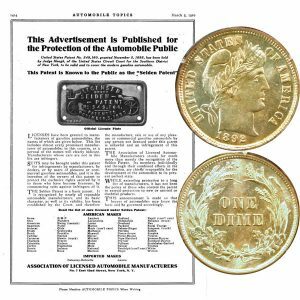 Today, the Barber Dime Coin remembers when the U. S. Patent Office awarded patent number 549,160 to George B. Selden for his combustion engine on November 5, 1895. The Hand Book of Gasoline Automobiles is issued annually by the Association of Licensed Automobile Manufacturers in the interest of its members who are the leading American manufacturers of gasoline cars, their dealers and those interested in the purchase of a high-grade automobile. It has definitely taken its place as a permanent annual publication, and is the accepted standard authority on the subject with which it deals. In its illustrations and specifications are fully and correctly described the product of the leading American manufacturers of automobiles, as well as representing the leading importers of gasoline cars which are licensed under the Selden patent. In the early Seventies, George B. Selden experimented with road locomotion, finally building an internal combustion engine until his success resulted in the application for a patent on May 8, 1879. This was about five years before Benz and Daimler operated their petrol vehicles in Germany. Selden’s patent No. 549,160 was granted by the United States Patent Office, November 5, 1895, and in it were granted the exclusive rights for a period of seventeen years, to manufacture, sell and use his invention. The patent covers broadly all gasoline automobiles which are accepted as commercially practical. The leading manufacturers and importers, after a thorough investigation, resulting in their conviction of its validity, have protected themselves, their dealers and the users of their product by securing a license under this patent. These licensees then organized the Association of Licensed Automobile Manufacturers, to protect their rights and that of their dealers and users under this patent and under the four hundred other patents in the control of its members as against those who used patented automobile improvements without regard to the rights of others. There is no combination among these manufacturers and importers and every one of them conducts his business entirely independent of the others, and among them all a free competition is maintained. The only bond between the companies represented herein is their recognition of this patent and the conviction that such recognition is a guarantee that the purchasers of their machines are guaranteed protection from the liability of suits resulting from the unlicensed use of the rights of the pioneer. The benefits of the organization have finally become apparent to the public in improved and advanced construction. It has been the aim of the Association, aside from the protection of its members in their patent rights, to conserve the interests of the manufacturers and purchasers of cars by producing cars of merit, and the results of these endeavors are apparent, for it is a well-known fact that the cars manufactured by the members of the Association, that are receiving this co-operation, are superior in every detail to those not deriving these accrued and cumulative benefits. The Barber Dime Coin shows with an advertisement listing all of the Selden licensees, circa 1910.